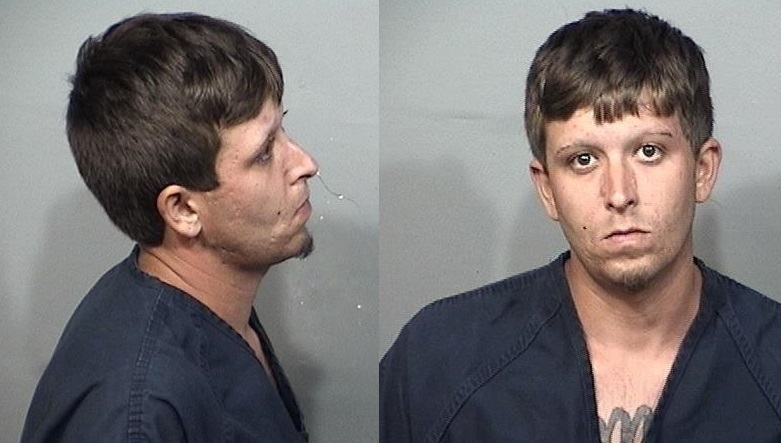 TITUSVILLE, Florida - A Florida man is in jail after police say he stole a woman's purse and hit her with his car in a Walmart parking lot in Titusville, Florida. Around 10:30 a.m. on Friday, April 14, 2017, 25-year-old Christopher Lynn Braun allegedly stole a woman’s purse out of her vehicle as she was returning an empty shopping cart to the cart corral in a Walmart parking lot located at 3175 Cheney Highway. The woman then confronted Braun and that's when police say he subsequently struck the woman with his 2006 Hyundai Sonata as he was fleeing the scene. Within minutes after receiving a 9-1-1 call reporting the crime, Titusville police were able to locate a vehicle traveling at a high rate of speed in the area of Park Avenue and Dixie Avenue that matched the description of the suspect’s vehicle. Detectives then followed the vehicle until it was parked at a nearby residence. Braun was arrested shortly thereafter. Police were able to recover the woman’s cell phone in a tree at the intersection of Hickory Hill Boulevard and Cheney Highway. The woman’s purse and contents were located in some bushes on Brittany Way. Police say that the woman only suffered minor injuries. Braun was charged with Burglary to an Unoccupied Conveyance, Grand Theft, and Leaving the Scene of Crash with Injuries. Braun is currently being booked into the Brevard County jail.